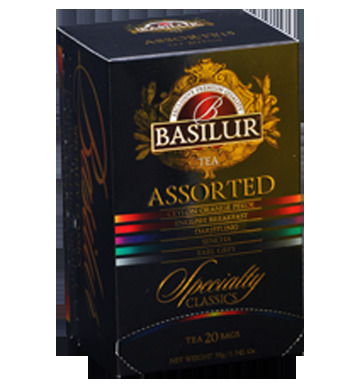 Speciality classic teas are some of Basilur's most celebrated teas with the kaleidoscopic, intricately designed exterior representing the art of drinking tea. We provide an authentic tea drinking experience, ensuring of an authentic and unforgettable experience. Each blend has been created using the original recipes established & enjoyed for over a century. 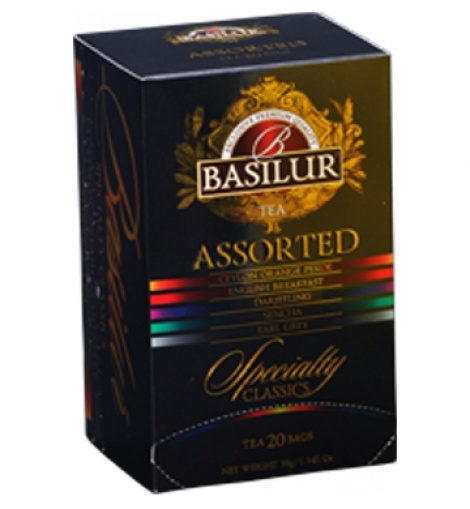 An exceptional collection of delightful tea blends of your choice. An Assortment of English Breakfast, Earl Grey, English Afternoon, Ceylon Orange Pekoe, Darjeeling and Sencha teabags. Ingredients: ENGLISH BREAKFAST/ ENGLISH AFTERNOON / CEYLON ORANGE PEKOE: Pure Ceylon black tea. DARJEELING: Indian black tea EARL GREY: black tea with Earl Grey flavour. SENCHA: green tea.